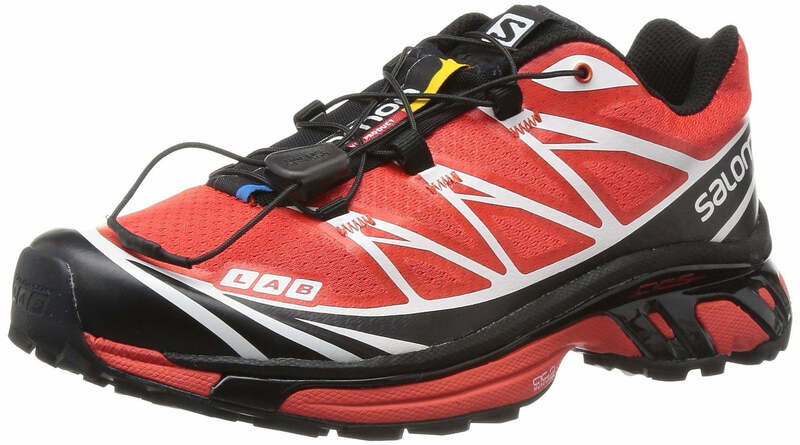 The Salomon Men's S-Lab XT 6 trail running shoe is a premium blend of traction, support, and speed now with the newly added Salomon endoFIT. The seamless upper is made with water-repellent, anti-debris mesh that stands up to extreme punishment and muddy conditions while cutting weight and bulk and preventing foot chaffing. EndoFit is an internal fit sleeve designed to hug the foot in exactly the right places and improve feedback and footwrapping. The Agile Chassis midsole combines extra-rebound cushioning layer with 3D+ Advanced Chassis that assists forefoot propulsion to power you through your stride and delivers joint-saving stability. Sensifit design envelops and cradles the foot for a precise fit that minimizes foot slippage. Ortholite sock liner combines a proprietary foam with an EVA heel cup for superior cushioning. Quicklace lacing system ensures a secure and customized fit. Contagrip rubber outsole provides durable traction over varying terrains. TPU toe bumper protects your toes from rocks and roots. Weight: 330 grams.